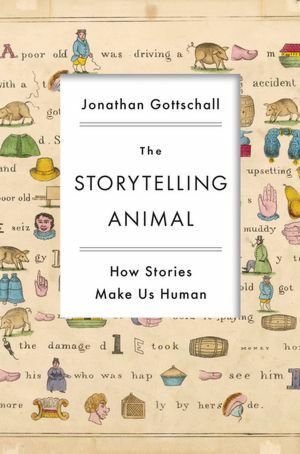 Eagleman’s lines appear in his review of The Storytelling Animal: How Stories Make Us Human, by Jonathan Gottschall, in this week’s New York Times Book Review. Narratives that we heed are inherently and intensely moralistic—as a group-level adaptation, they encourage pro-social behavior and are “as important as genes,” Eagleman says. “Gottschall points out that for a story to work, it has to possess a particular morality. To capture and influence, it can’t be plagued with moral repugnance . . . If the narrative doesn’t contain the suitable kind of virtue, brains don’t absorb it. A second surprise: The dominant themes of story aren’t what we might assume them to be. Consider the plotlines found in children’s playtime, daydreams and novels. The narratives can’t be explained away as escapism to a more blissful reality. If that were their purpose, they would contain more pleasure. Instead, they’re horrorscapes. They bubble with conflict and struggle. The plots are missing all the real-life boring bits, and what remains is an unrealistically dense collection of trouble. Trouble, Gottschall argues, is the universal grammar of stories. The same applies to our nighttime hallucinations. If you’ve ever wanted your dreams to come true, let’s hope you don’t mean your literal nocturnal dreams. These overflow with discord and violence. When researchers pick apart the hours of dream content, it turns out dreamland is all about fight or flight. I’m looking forward to reading this and sharing it with my memoir students. Thanks for the reminder! Have you read the book yet, Richard? I haven’t! That review in the Times was the first I’d heard of it. I find such studies very interesting, though as always in my case he’s preaching to the choir. If you click on the “evolutionary psychology” category on my blog’s sidebar you can see other books on this—but this one looks like one of the best and most accessible. Thanks for the lead on the book. Sounds like an interesting read. I love that line, “Neverland is our evolutionary niche….” It just seems to confirm the necessity of story — it’s necesary to survival. I think stories, among other things, help us evolve intuitively and emotinally. So true, Todd. And different groups tell themselves different stories—the competing narratives will be interesting in the upcoming presidential contest. Richard, your comment about different groups telling themselves different stories reminded me of an experience I had in Africa. My young adult Namibian students had grown up in rural villages where the evening’s entertainment was sitting around the fire telling stories. They told fables with animal characters, each animal depicting a personality trait, so these were, really, morality tales told for the moral edification of the children. I invited them to write their own fables, and I collected these and “published” them for their academic community. These young adults had never read any fiction, so I acquired for them copies of a book of African short stories which we read together and discussed. For the next term they each wrote their own short story, and most of these were based upon their life experiences. It sure beat teaching them grammar! And I was enormously enriched. There has been much debate over oral vs. written literatures, particularly in the last 75 years or so. It sounds like you garnered the best of both worlds in your experience in Namibia. How enriching indeed! What an experience, for you and for them. Their stories and storytelling time sound very wise and healing. I know as kids we begged our mother for stories, meaning tales of her growing up with her brothers and sisters and their adventures. We laughed to hear of our war hero uncle’s ornery child self, and I think it bonded us as a family living far away from that time and place. Is that you in the boat, Richard, and, if so, did you catch any fish? That’s me shooting the picture in another boat. 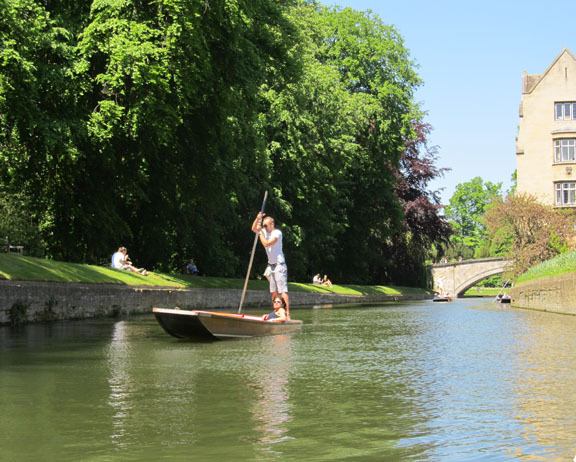 I imagine that stream, flowing through Cambridge, England, is full of naive fish but didn’t wet a line. HI, Richard, I haven’t read the review (or the book) — I’ve been unwired on the North Shore of Lake Superior for the past week. I’m always a little uneasy when anyone talks about morals, virtue and moralistic stuff. But it is an interesting idea, and one that I’ll try to test against novels and memoirs I like. I’m not sure what the “suitable kind of virtue” is — maybe if I read the review/book I’ll see what he means.